from last September, where a revamped Google Forms was released as opt-in-only until we could add additional features and functionality. 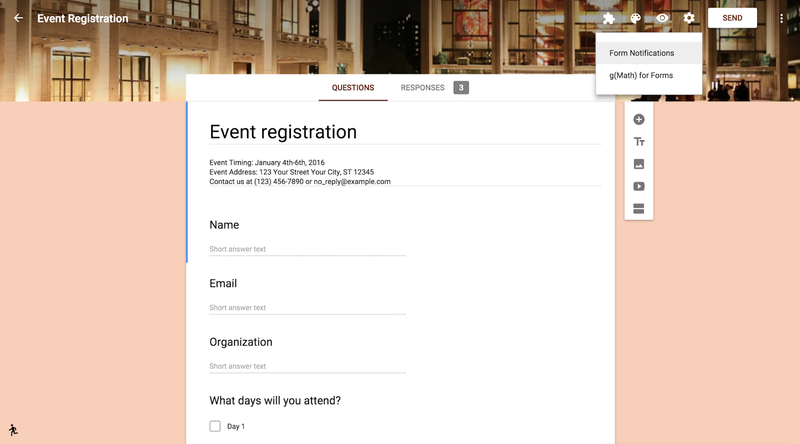 Once launched, Form creators will be redirected to the new Google Forms whenever they create a new Google Form. To opt-out, users may click the “running man” icon in the bottom left-hand corner. Form creators will be able to use add-ons and edit scripts in the new Forms editor. 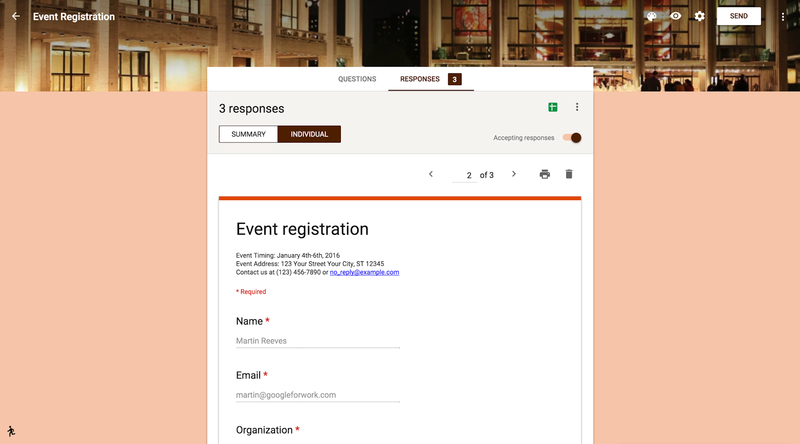 Popular tools like Form Publisher and g(Math) for Forms have helped creators extend the capabilities of Google Forms. In addition to the summary of responses currently available in the Forms editor, creators will now be able to see individual survey responses as well. This will save valuable time when analyzing Forms. At the same time, if there’s so many responses that there may be performance issues, Google Forms will let users know how to visit the responses separately, instead of slowing down the editor. Work and Education-related templates will become available on the Forms home screen to jumpstart your Form creation at forms.google.com. We currently have several templates for event feedback, event sign-ups, job applications, and more. Users can click on the More link to start a form from any of the newly created templates. Your domain’s existing templates are still available and can be found at drive.google.com/a/google.com/templates. 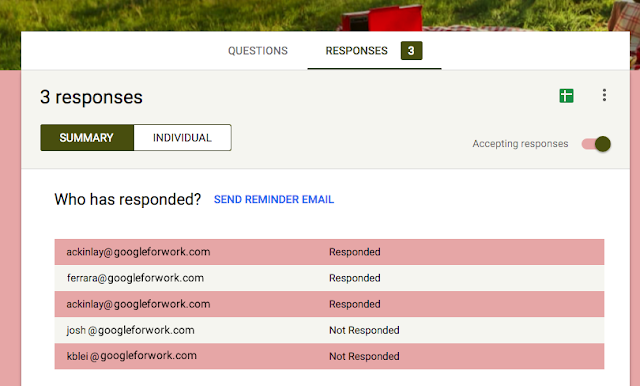 Form creators will now be able to configure Google Forms to send them email notifications whenever someone responds. The default is set to off, but users can enable it from the form’s settings menu. Form creators will be able to see who they’ve sent their forms to and who still needs to respond. There will also be a new option to send out follow-up reminders as needed. 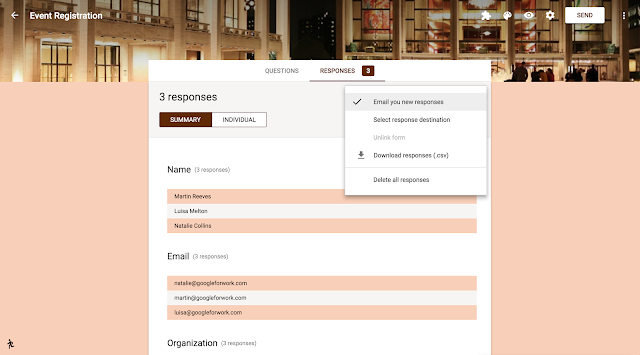 Responders will only see the new Google Forms for those forms created or edited in it. To opt out and go back to the old Google Forms, simply click the running man icon in the bottom left-hand corner of the Google Form and follow the prompts. Today, the new Google Forms will become the default option for Form creators. This follows our launch from last September, where a revamped Google Forms was released as opt-in-only until we could add additional features and functionality. Once launched, Form creators will be redirected to the new Google Forms whenever they create a new Google Form.